There many ways to prepare a delicious pasta with seafood and other fishy ingredients. You can use mussels and clams or crab meat and shrimp or salmon and other fish meat. The important thing is to combine the ingredients in the best way possible, adding a little sauce to enrich the dish and a nice, personal touch to make it special. The last weekend I was craving (as usual) for some nice pasta. I had at home some canned crab meat, some caviar (the cheap one you can easily find in supermarkets) and surimi and decided to combine all of them in a rich seafood linguine with saffron sauce with the addition of some already-cleaned shrimps. The preparation is very easy and takes a little longer than the time to cook the linguine. Just put some olive oil in a hot pan with some garlic and parsley (either fresh or dry). Add the shrimps and let them cook on a medium-high heat. The shrimps are done when they completely change color. Once the shrimps are cooked, add the crab meat and the surimi you have previously sliced. You do not need to cook them since they are usually pre-cooked and just need to warm them up. During this process you should add some spoons of white whine, that will enhance the dish flavors. At this point you should have your pasta already boiling and you should add some spoons of the boiling water to the seafood mixture, together with some saffron powder and nutmeg. Stir the seafood well and add some butter or cream to make it creamer. Do not fry the cream or the butter. You just need to keep them warm to welcome the linguine once ready. You may add some chilly or black pepper if you like and a handful of parmesan (I like cheese on top of seafood but it is up to you). Once the linguine are ready, dry them and put them in the pan. Mix well and plate them hot. On top of each dish, add a spoon of the cheap caviar you have found in the supermarket and serve to your guests. 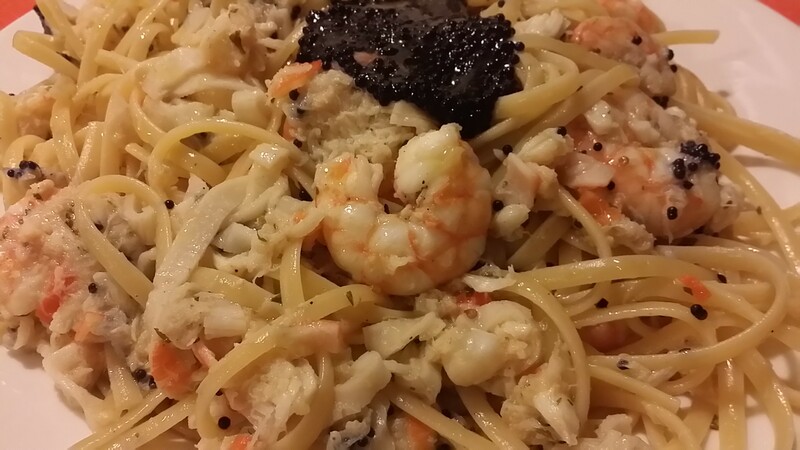 This entry was posted in Easy to Cook, Homecooking, Italian Food, Pasta and tagged Caviar, cooking, Italian food, Italian Recipe, Linguine, Pasta, Pasta Lovers, Saffron, Saffron Sauce, Seafood, shrimps, Spaghetti, surimi on November 1, 2015 by andreadetto. The pasta saga today continues with one of my preferred adapted recipe: spaghetti with shrimps and ricotta sauce. I like experimenting new flavor combinations in the kitchen, especially turning well known recipes in lighter versions to be consumed at home without feeling guilty for the extra intake of fats and calories. Yesterday I have turned the famous Creamy Shrimps Alfredo Pasta into something much lighter but even tastier: Shrimps Pasta with Creamy Ricotta Sauce. It is really easy to prepare and you will successfully manage to substitute butter and full fat cream with lighter and healthier olive oil and ricotta cheese. You just need to put in a pan some olive oil, garlic and parsley. Let the ingredients brown a little before adding the shrimps. Stir them occasionally and add a pinch of salt, a sprinkle of white wine and some more garlic and parsley during the cooking process. Once the shrimps are properly cooked, you should add some fresh ricotta. This particular kind of cheese has a very limited amount of fat, hence it is not going to melt in the pan spontaneously creating a smooth and rich cream. In order to do so, you shall add some water that you can take from the pot where you are cooking your choice of pasta or maybe a little milk. While mixing the ingredients together, add some nutmeg, grated Grana Padano (my favorite parmesan cheese) and if you like some saffron that will make your sauce even tastier. This creamy shrimp pasta is much lighter than the common Alfredo version but not less tasty. Once the pasta is ready, mix all the ingredients and serve hot. This entry was posted in Cooking, Easy to Cook, Homecooking, Italian Food, Recipe and tagged cooking, Pasta Lovers, Ricotta, shrimps, Spaghetti on September 11, 2015 by andreadetto. Yesterday I was craving for some nice pasta and was thinking about the best condiment to prepare when I found a top quality eggplants at a very competitive price. “Great, let’s make some Pasta alla Norma” I thought and bought few aubergines. Preparing the sauce is very simple even though it takes quite some time. You just need eggplants, some chopped or peeled tomatoes cans, garlic, parsley and basil. The tradition wants you to put some dried/smoked ricotta cheese on top of your pasta but some grated Grana Padano is fine. Pasta alla Norma is excellent when freshly made but they are even better the day after reheated in the oven or pan..
Just slice the eggplants and put a pinch of salt on the top side of the slices. Leave them with the salt some 10/15 minutes, until they release the bitter water that usually is brownish. Wash carefully the slices in order to remove both the bitter water and the excess salt and then dry them with kitchen paper. Chop the slices in smaller pieces, any shape is fine, and put them in a pot where you had preheated some olive oil together with crushed garlic and parsley. Cook the eggplants at a moderate heat, adding from time to time little water or some white wine to enrich the taste. The addition of some water makes the eggplants tenderer and reduces the cooking time. Once the eggplants are almost completely cooked (they reduce in size and become tender), add the tomatoes and cook ad a low heat for 30 minutes. Add little sugar or bicarbonate to reduce the tomatoes acidity. Serve the pasta with your tomatoes and eggplant sauce with a sprinkle of Grana Padano on top. 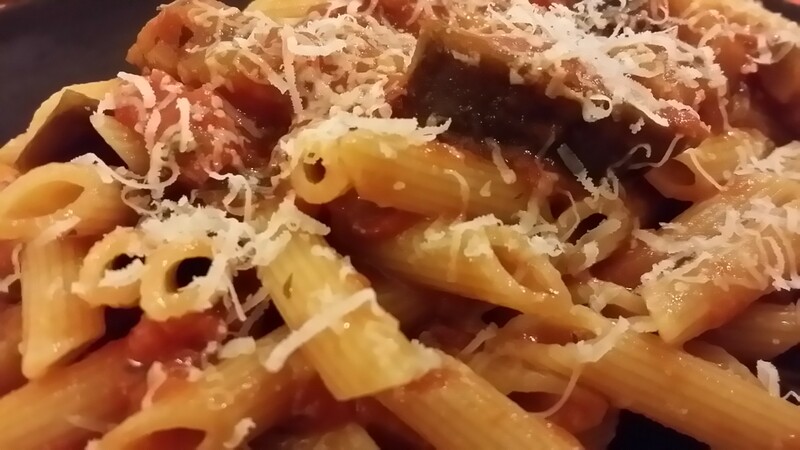 This entry was posted in Easy to Cook, Homecooking, Pasta and tagged cooking, Eggplants, Foodaholic, Italian food, Pasta alla Norma, Pasta Lovers on September 5, 2015 by andreadetto. Spaghetti alla Carbonara with 4 cheese with love! Every time I post a photo or I discuss about the perfect “pasta alla carbonara” recipe with friends, it ends up in a fight and a general scorn. Should I use the whole egg or just the yolk? Should I put pepper or nutmeg? Should I use sliced “pancetta” (bacon) or the cubes one? And many more. Once a chef friend told me that the carbonara should be creamy, hence I should use only the yolk with a little cream avoiding to cook the mixture in the pan and adding an handful of parmigiano on top. I don’t like to waste the egg white and therefore I usually use the entire egg. I do not have a fix recipe since I adapt it in relation to the food I have available in the fridge. What is sure is that we are going to use eggs, bacon (preferably smoked) and parmesan cheese. Remember that you shall not use onions in the carbonara pasta. 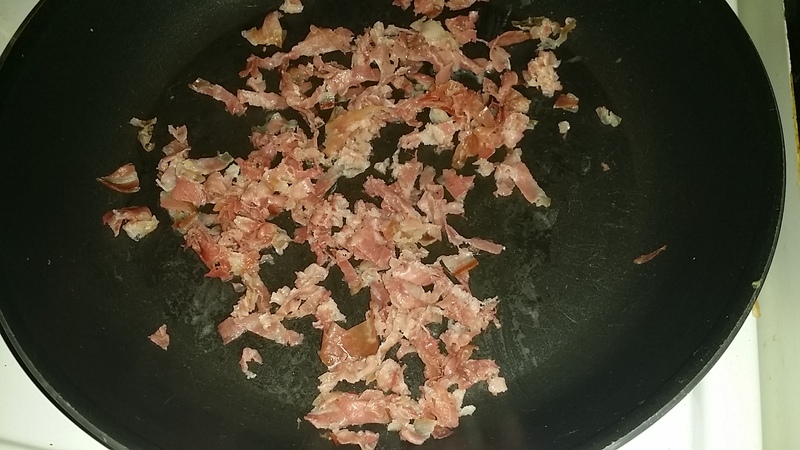 Pancetta (bacon) has to slowly fry in its fat. Do not add any oil or butter for an unaltered bacon taste. Yesterday I was craving for a deliciously creamy ‘spaghetti alla carbonara’ and opted for one of my favourite invented recipes. I used sliced bacon, not smoked but natural, spaghetti, parmesan cheese, kashkaval, brie cheese and another soft cheese I had in the fridge. I chopped the 100g ‘pancetta’ I have found in Waitrose supermarket and warmed it up in a pan without oil or butter until crispy. From time to time I added little water from the pot where the pasta was cooking. It helps extracting and distributing the bacon flavour in the pan. You can sprinkle it with little wine if you prefer, like a dry white wine for instance. My Spaghetti alla Carbonara with four cheese are a bit heavy, not really Italian but super good. While the bacon is frying and the pasta is cooking, you should put in a cup one egg every 150g of pasta, some olive oil, salt, a pinch of pepper or nutmeg, grated parmesan and cubes of easy-to-melt-cheeses. You shall mix everything together even though you won’t obtain a perfect mix. Once the spaghetti are cooked, you shall dry them and toss them in the pan with the bacon. Toss with the heat on medium. This operation will help the pasta to absorb the bacon fragrance. After you have tossed the pasta few times, add the eggs mix and toss again until the cheese is melted and the pasta evenly covered by the right proportion of eggs, cheese and bacon. Mmmm . . .yummy. 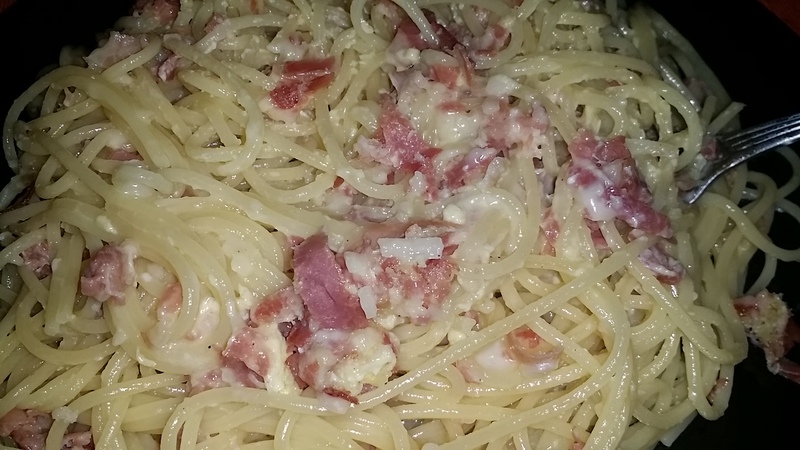 This entry was posted in Cooking, Easy to Cook, Italian Food, Italy, Pasta, Spaghetti and tagged Carbonara, cheese, cooking, Eggs, Food, food lovers, Foodaholic, Foodphoto, Italian food, Italian Recipe, Pasta, Pasta Lovers, Spaghetti on August 26, 2015 by andreadetto. I am very lucky since my partner got a nice present from an Ukrainian friend: a jar of excellent caviar, not the beluga one, very expensive and superb in taste but though a very good one. I was thinking: what shall I do with this excellent caviar? I discarded the appetizer option since it was a shame to waste such a good ingredient with toasted bread and spreadable cheese. 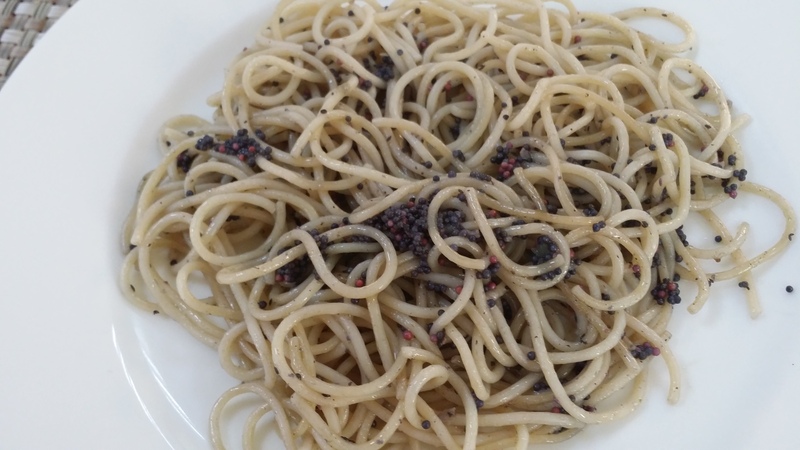 At last I had a brilliant idea: let’s make some spaghetti with caviar and lemon aroma. I tried to make them also with regular, cheap looks-like caviar, and the result was good. The recipe is super easy and it takes slightly less than the time required to cook the spaghetti. Just take a pan, big enough to contain the amount of spaghetti you want to cook. Put some butter in the pan and melt it at a very very low heat. I prefer to use salty butter, but also the unsalted one is alright. Remember that the butter should not fry. If you want to make the lemon sauce lighter, you can add some olive oil and reduce the quantity of butter used. For the quantities, it really depends on your taste. I used something light 20 grams of butter for 300g of spaghetti, but I have added 3 table spoons of olive oil in the mix. Once all the butter is melted, add some lemon zest. Not too much otherwise your dish will be too citric. Mix it with the butter sauce and let the lemon release its juices in the pan. Do not fry the lemon. You can add a pinch of nutmeg and salt (if the butter is unsalted) to make it even tastier. If you want to have the sauce a bit creamer, you might add some grated parmesan (I prefer Grana Padano) and let it melt in the sauce. Once the spaghetti are cooked, mixed them with the sauce and then add one or two spoon of caviar and mix well. The pleasant lemon aroma is simply and perfectly conjugating with the caviar delicateness. An easy recipe, delicate for sophisticated tastes. 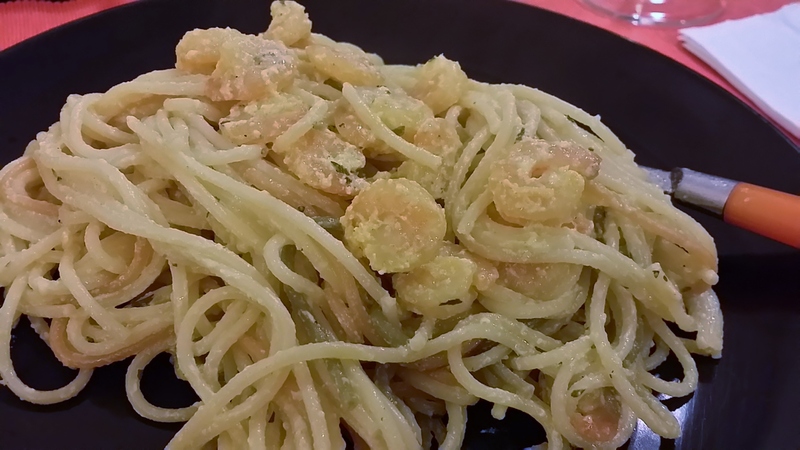 This entry was posted in Cooking, Easy to Cook, Food, Italy, Pasta, Recipe, Spaghetti and tagged Caviar, cooking, Dinner, easy to cook, Food, food lovers, Foodaholic, Italian food, Italian Recipe, Lemon Zest, Pasta, Pasta Lovers, Spaghetti, spaghetti with Caviar on August 6, 2015 by andreadetto. Is Quinoa really the super-food everyone talks about? I guess we are all exposed to the dominant philosophy of the so called Super Foods. They apparently have some miraculous nutrient that is indispensable for our body and health. One of these super-foods is Quinoa, the gold of Inca, super-protein-source, the food of the future and so on. In the past months, something more than a year I would say, Quinoa was an obsession. No home party was fashion enough if a Quinoa salad wasn’t displayed. My partner was always looking for a Quinoa option in each and every restaurant we went to. I was often finger-pointed as a Neanderthal or a food-uneducated person because I was not a big fan of the gold of Inca. It’s not that I did not like it, it is good indeed, but I don’t like the super-food concept. 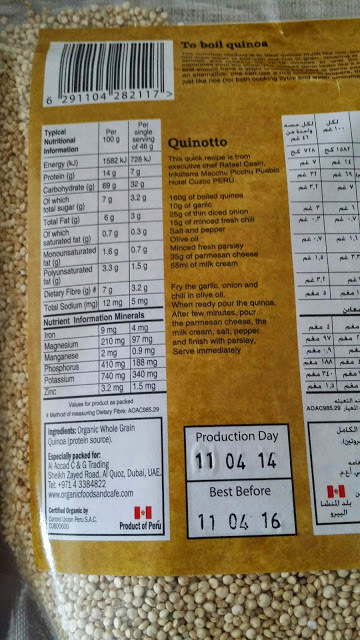 Quinoa Nutrition Facts – Not that super. Since my partner liked it, I sometimes bought a pack of quinoa and prepared some salads for dinner. One day I was contemplating the quinoa bag and noted that the Nutrition Facts are not that “super” as many supporters think. The super-protein seed has 14g of Protein per 100g of product, 7g of Fibres and 6g of ‘relatively good’ Fat. Super. Nevertheless, Quinoa has 69g of Carbohydrates! As such is not really indicated for those who want to pursue a low-carb diet and should be eaten with moderation especially before bed time. With the minerals and vitamins content, Quinoa is definitely an healthy option among many others but I would not label it as “miracle seed” or “super-food”. Being Italian, I have a very deep addiction to pasta. I personally love the taste of pasta itself and as such most of the time I have it with very light and gentle seasoning. In the past years the pasta producers come up with a healthier option: whole-wheat pasta that add the benefits of higher levels of fibres, the old fashioned taste of pasta that I really like. 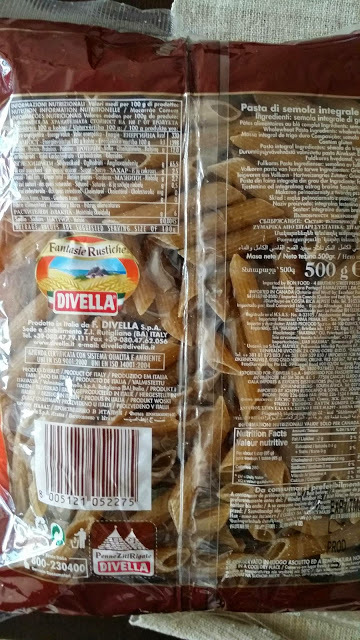 I was quite surprised in noticing that the Nutrition Facts of my Divella whole-wheat pasta are actually quite similar to the “super food” quinoa. My pasta indeed has: 12g of Protein per 100g of product, 6g of Fibres and 2.2g of ‘relatively good’ Fat and only 65.5g of Carbohydrates! Moreover, it approximately contains the same levels of minerals and vitamins Quinoa has. There are available many other healthy options that are sometimes neglected and could instead be used sometimes to enrich our diet. We have for instance kamut and spelt. Kamut is an ancient wheat specie that is still cultivated in some region of the world such as USA, Canada and Middle East. It is more resistant to dry period than the durum wheat and as such it is ideal to be cultivated in arid regions. Kamut nutrition facts are in average: 15g of Protein per 100g of product, 11g of Fibres and 2g of ‘relatively good’ Fat and only 60g of Carbohydrates! Moreover, It contains the same amount of minerals and vitamins as Quinoa. More details on kamut.com website. Spelt (like farro, emmer and einkorn) is another ancient wheat species that represented an important staple food in Central Europe during and after the bronze age. Presently it survives as relict crop in some part of Spain, Italy and Central Europe. However lately the organic food industry is showing a crescent interest towards this cereal that require very little attention and a very limited amount of fertilizer and chemical products to grow. 100 g of Spelt averagely contain: 14.5g of Protein per 100g of product, 10.7g of Fibres and 2.4g of ‘relatively good’ Fat and only 60g of Carbohydrates! Moreover, It approximately contains the same amount of minerals and vitamins as quinoa. The list of cereals and pseudo cereals available on the market could be much longer, but I think it is sufficient to have mentioned two-three options that are equal to or more nourishing than quinoa to make a clear point: quinoa is definitely a good and healthy food especially if we consider that it is gluten-free and as such it is a good option for those affected by celiac disease. It is worth of mention the fact that the excessive attention towards quinoa is creating serious problems to the local farmers as reported by Steve Holt on takepart.com. In his brilliant article about the consequences of the increased demand of Quinoa seeds currently cultivated in poor areas of Bolivia and Peru, he states: “Western consumers have a choice on their hands: Scale back on consumption, hoping it decreases the global demand, or learn to live with the realities of how their quinoa obsession affects the health and land in two of South America’s poorest nations“. Joanna Blythman, who described on The Guardian in January 2013 the dramatic problems caused by the increasing demand of this pseudo-cereal not only to the poor farmers but also to environmental ecosystem, stated: “The appetite of countries such as ours for this grain has pushed up prices to such an extent that poorer people in Peru and Bolivia, for whom it was once a nourishing staple food, can no longer afford to eat it. Imported junk food is cheaper. In Lima, quinoa now costs more than chicken. Outside the cities, and fuelled by overseas demand, the pressure is on to turn land that once produced a portfolio of diverse crops into quinoa monoculture“. In conclusion, we have many healthy and nutritious options available and that we can use to vary our diet and increase our daily intake of proteins and fibres and lowering the carbs. Let’s mix them without preconceptions to have a balanced diet and to ease the consequences caused by the increase in the prices of this crop to the poor farmers. This entry was posted in Food, Opinion, Review and tagged Compare, cooking, Food, Pasta, Quinoa, Super Food on June 23, 2015 by andreadetto. I have been living abroad since 2009, specifically in Middle East, and met many people of different culture and culinary habits. Italian food is generally appreciated as simple and tasty and has gained its reputation also because the Mediterranean diet famous in the Italian peninsula is recognized as one of the healthiest one. When I first gathered with non-Italian friends in an, “so called”, Italian restaurant, I understood that there is a huge confusion about what it is really Italian or not. For instance, many Italian Restaurant chains offer meals that simply do not exist in Italy and would attire disgust and strange looks from Italians. Therefore, if you are planning to invite for dinner an Italian friend or if you are going to visit Italy for leisure or business, you should take into account the following Essential Food Rules. If your partner is Italian and it’s the first time your mother-in-law invites you for dinner, please stick to this rules for a good first impression. Even though Alfredo is a typical Italian name and this kind of pasta is sold in many “Italian” restaurant chains, it simply doesn’t exist in Italy. Please remember that it is considered almost a blasphemy to add chicken to any kind of pasta. Chicken is a main course and you can eat it with salad, potatoes or other veggies. Only suggesting the possibility to put some chicken in pasta can provoke confused looks and reactions like “Che schifo!” (How disgusting!). If you fancy a creamy pasta with mushroom you might want to try some pasta with mushrooms and cream for instance, or pasta with broccoli and anchovies if you like the broccoli concept. Another thing that is very badly perceived by Italians is to alter the genuine and almost perfect taste of pasta, pizza and lasagne with tomato ketchup. I can assure you that you will get angry and puzzled looks from your Italian mate or from any waiter in a really Italian restaurant if you start doing so. I had the same reaction the first time I saw a friend of mine ruining a fabulous lasagna with a healthy quantity of ketchup. I couldn’t help but burst in a “What the hell are you saying?” when he enthusiastically exclaimed “wow, now it is a real lasagna!” after having emptied half bottle of ketchup on it. 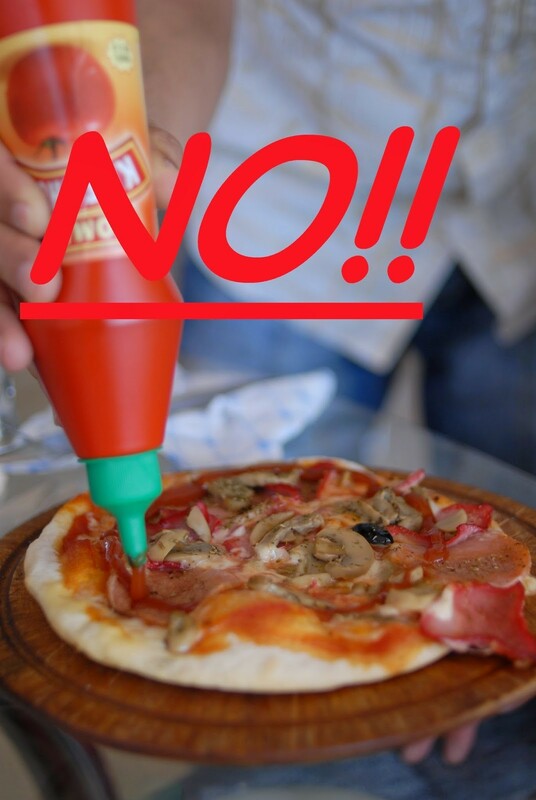 Italians rightly use ketchup for hot dogs and fries, but not as additional condiment to any other food or dish, especially if home made. 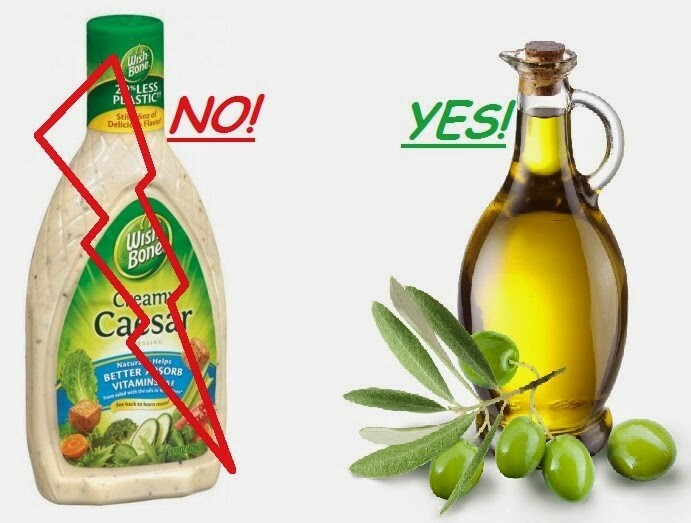 The only real Italian condiment is extra virgin olive oil, sometimes accompanied by vinegar (plain or balsamic). Therefore don’t expect to receive any kind of dressing or topping with any of your meals. Italians want to taste the natural flavour of the food they are eating and any dressing should just enhance in it and not covering it. So, be ready to renounce to French dressing for your salad, Ranch sauce for your chicken breast and any other kind of additional condiment that differs from plain olive oil. And even in that case, remember to use just a little quantity of oil and avoid flooding your plate with it. If you think that olive oil is boring, just try few of the dozens different extra-virgin olive oils available on the market like the ones produced in my home town. Here you have an example. Many people use to drink any sort of product during their meal: ginger ale, iced tea, milk, juices, coke, lemonade, bacardi breezers and so on. This in Italy would rarely happen. The table is usually set with water (sparkling or still) and wine and sometimes beer. Cocktails and liquors are reserved for aperitivi (before dinner drinks) or digestivi (after meal drinks). Milk is drunk almost exclusively at breakfast. There are obviously exceptions, with people drinking Coke or other similar soft drinks during a meal, but it wasn’t so common a decade ago. With pizza, it is common to have beer, coke or other soft drinks. While your Italian mates will find awkward to have bread dipped into an olive oil-vinegar-parmesan mix while the food is getting ready, they might taste it to please you and to momentarily calm their appetite. It’s not a big deal after all, it is just that in Italy we don’t use to serve it before a meal. For this reason you should keep it in mind when travelling to Italy. You might receive some bread and grissini (bread sticks) before your food is served but definitely you won’t receive any olive oil and balsamic vinegar. On the other hand, it is very common to use bread as a proper tool, almost comparable to the normal cutlery, to enjoy the meal. 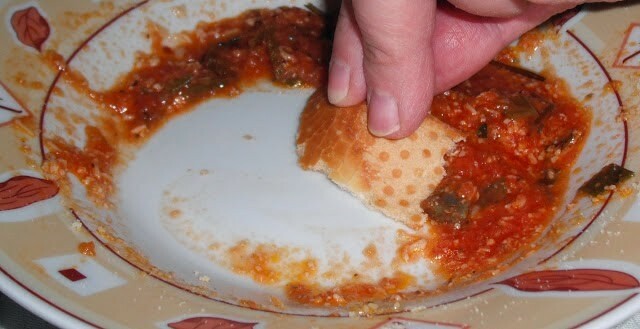 Once you have emptied your plate, you are allowed to do the Scarpetta, literally the little shoe, to clean it and avoid losing some of the wonderful condiment or sauce left in your plate. However common it could be at home, please note that it is considered rude to completely clean your plate in a fine dining restaurant. For Italians eating isn’t just a way to sustain themselves, it is a ritual. Sharing a meal has many social implications and cannot be performed by eating a bowl of cereals in front of the TV or grab something to eat in a drive-through. 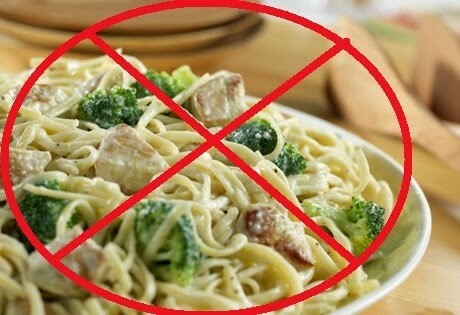 Italians don’t like very much fast foods or quick meals and usually spend hours for a ‘simple’ dinner. Therefore plan it in advance. No e-mails, letters and other external factors should force you to eat quickly and clear the table soon after the last bite is gone. I have sometimes discussions with my partner when she does it. The dishes can wait, the clean up as well. It’s dinner time and we shall relax. If you are in Italy and go out for dinner, don’t expect to receive a quick service. It is usually slow and your dinner could take more than one hour. But it isn’t just the waiter laziness that create this situation. It is the fact that Italians love to enjoy every single bite of their food while amicably chatting with friends and loved ones. Once the main course is done, allow yourself time enough to digest and have some dessert or fruit and then offer to your Italian mate an espresso or a digestivo. It is, in fact, very common to have either coffee and/or liquor (Limoncello, Sambuca or Amaro Montenegro are my favorite) after a pleasant meal. This entry was posted in Food, Italy, Must Know, Recipe and tagged Chicken Pasta Alfredo, cooking, Food, Foodaholic, Italian Recipes, italy, Pasta, Pizza, Rules on June 15, 2015 by andreadetto.